Growing e-commerce opportunities is a recurring theme in the launch of six new transport-related equity ratings published today by Deutsche Bank's analyst team headed by Amit Merhotra. In one lengthy report, Deutsche added coverage of six companies. Three of them launched with "buy" ratings: Ryder Transportation, Forward Air and Atlas Air Worldwide. Three companies got “hold” ratings: Kansas City Southern, Expeditors and SAIA. The team's commentary on Forward Air was typical of its focus on e-commerce as a driver of its buy ratings on companies that Deutsche believes can benefit from that sector. In the case of Forward Air, Deutsche described its Expedited LTL business--accounting for 80% of its profits--as "well positioned in an environment of secular e-commerce growth, with retailers increasingly moving to a regional distribution model to cut delivery times and requiring on-time and in-full delivery." Similarly, the analysts at Deutsche said of Atlas Air Worldwide that the company is "poised to benefit from continued growth in e-commerce and global airfreight markets via partnerships with Amazon and DHL, which we expect will drive strong top-line growth over the next 12 years." Those customer relationships with Amazon and DHL, the report said, are opening the door for further opportunities. Atlas Air has the "ability to facilitate special services to specific customers (and Amazon and DHL are cited) (that) could lead to additional strategic partnerships and longer-term business opportunities above and beyond organic growth opportunities." Expeditors (NASDAQ: EXPD): Expeditors' outlook is described as "good, but not great," with a hold rating put on the stock. The company has been impacted by "structural shifts in incremental margins," and one key statistic was cited: revenue per employee is up 5% since 2011; operating expenses per employee are up 15% during that time. The Deutsche report says a company like Expeditors, with 72% of its revenue tied to freight forwarding and 28% in brokerage, "thrives on volatility." But when market conditions take a "limited incremental supply of air and ocean freight capacity" and combine it with "moderate global trade growth," that means a "slow and steady" market that won't provide the volatility that is positive for a company like Expeditors. The Deutsche report also notes that Expeditors is not targeting acquisitions for its growth, which given the limitations that a less volatile market will provide "limits potential for meaningful acceleration in earnings growth and multiple expansion after recent outperformance." But revenue forecasts are solid, and e-commerce is a reason. The "secular e-commerce trends" that the report refers to numerous times will "continue driving increased demand for faster and more time-definite modes of transportation" for companies like Expeditors. Ryder (NYSE: R): E-commerce doesn't come up in Deutsche's discussion of Ryder. But flat to slightly weaker used truck markets--a key factor in Ryder's financial performance--are "discounted and in the rear-view mirror, following downward adjustments to residual values that de-risks prospective earnings growth and positions the company well for a recovery in older truck values," the report said in explaining its "buy" rating. The company, which has about 2/3 of its revenue in its leasing, rental and dedicated segments, "should continue to enjoy solid organic growth opportunities given strong U.S. freight flows and limited driver availability." The report quotes Ryder chairman and CEO Robert Sanchez as saying the market is "as strong as I've ever seen it." Deutsche sees 7% growth in total sales, enough for double-digit increases in net income. Depreciation figures are also a key driver for Ryder, hand-in-hand with asset sales. Ryder has experienced higher depreciation expenses recently, the Deutsche report said, but that is "sowing the seeds for strong earnings growth when asset values recover." SAIA (NASDAQ: SAIA): In putting on a hold rating for the LTL company, Deutsche Bank concedes they are "late to the SAIA story." The market is strong for its services, the report said, but operating rate comparison to other non-unionized peers like XPO and Old Dominion make SAIA's mid-teen margins look weak by comparison. But SAIA is seeking expansion in the Northeast that will "provide significant scale opportunities...and allow for continued acceleration in incremental margins toward 20%." Kansas City Southern (NYSE: KSU): The class 1 railroad gets an initial hold rating. Much of it is a view that the Deutsche target price of $119 is near the top of the company's 52-week range already. The third quarter outlook for the company is based on weaker volumes of coal and frac sand, and an expected increase next year in capex and taxes. But still, Deutsche sees double-digit earnings growth both next year and in 2020. Although weaker coal and frac sand numbers were cited, it still sees double digit compound annual growth rate for crude, petroleum (mostly products to Mexico), plastics, automotive (cars coming out of Mexico) and intermodal, both in the U.S. and across the Mexican border. Atlas Air (NASDAQ: AAWW) The previously mentioned Atlas Air buy rating, besides e-commerce as a factor, is also being driven by a shift in airline purchases, with revenue growth less tied to Atlas aircraft purchases. Atlas, as part of its wide-ranging deal with Amazon, granted the e-retailer warrants to purchase 20% of Atlas over five years and an additional 10% over seven. The Deutsche report doesn't talk about a full takeover of Atlas by Amazon, but plenty of other people have. 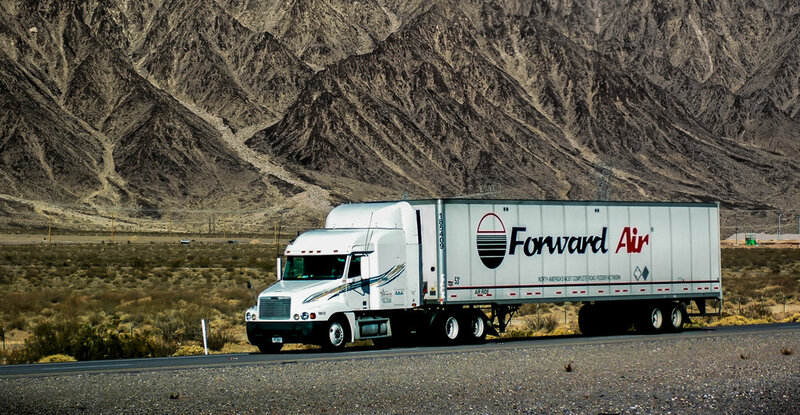 Forward Air (NASDAQ: FWRD): In addition to discussing Forward's growth prospects in e-commerce, Deutsche also is high on its opportunities in intermodal. The size of that business at Forward has doubled in the past few years, to now be a $200 million run-rate segment. A series of acquisitions in the field has been significant, in "immediate value creation and incremental cross-selling opportunities," the report said. "We are optimistic that Forward will continue to executive on this strategy with line of sight of $300 million of revenue in 2020."